Griddles are heavy duty kitchen equipment used to cook many different foods. Griddles require their own specialized cleaning to maintain them. Here you will find all the necesary restaurant supply tools to clean your griddle including grill scrapers from Vollrath, Russell Herrington, Nemco and Mundial. Vollrath Redco Grill Tender Scraper - 18 in. 3M GB12 Black Grill Brick 3.5 in. x 4 in. x 8 in. 3M Scotch-Brite 82 Heavy Duty Griddle Pad 4.5 in. x 5.5 in. 3M Scotch-Brite 46 Nylon Griddle Polishing Pad 4 in. x 5.25 in. 3M Scotch-Brite Fiberglass Griddle Screen 4 in. x 5.5 in. 3M Niagara Griddle Screen 4 in. x 5.25 in. Glit Disco Griddle Pads Brown - 4 in. x 5.5 in. Glit Disco Griddle Screen - 4 in. x 5.5 in. Mundial Griddle Scraper Handle White - 4 in. 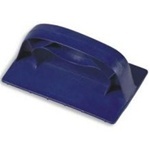 Russell Sani Safe Griddle Scraper - 4 in. Russell Griddle Scraper - 4 in. 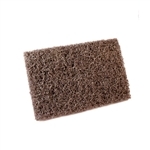 Russell Griddle Scraper - 3 in. 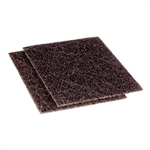 Scotch Brite Quick Clean Heavy Duty Griddle Pad - 4 in. x 5.25 in. 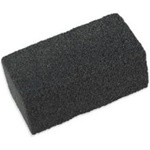 Black Grill Brick - 8 in. x 4 in. x 3.5 in. 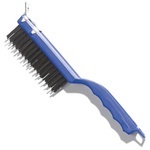 Scotchbrick Heavy Duty Griddle Scrubber - 4 in. x 6 in. x 3 in. Buy your restaurant supply griddle cleaning tools from the leader in restaurant supply to keep your griddles clean and sanitary. The food tastes best when cooking on clean surfaces.